Pulled everything but the door panels and dash out of the interior. Vacuumed the mouse @!#$ out of the interior. Pulled the seat mounts off and cleaned them up, ready to bolt to my Corbeaus. Contacted 2 carpet places about new carpet. Test fit a Cav rear bench in. Some foam trimming and it should fit nicely. Probably just recover the back with Cavi material to match. Looks like a brake line underneath is leaking. Fix that and see if it still needs a master. All interior trim will get sanded, washed, and repainted.... maybe if I get crazy in the future, I'll make a few C/F pieces. Also found some halfway decent tires for the 13"s, for now. Once it's movable, I'll take it to my buddy's place to get the rust spots cut out and replaced with new sheet metal. i gotta go with option 1... the modified stock one. and as long as you ditch the gay 80s eggcrate grille ill be happy no matter what you do. cant wait. this is going to be awesome. I think I agree with brad here. That shortened tucked bumper looks great, but that grill is bad looking. It'll be getting a grill like the Yellow Opel above. Trying to find the lower front valence to do the Euro bumper swap. Appears to be part of the radiator support or what ever you call it. Bulkhead? Idk. Makes it that much harder to find when you don't know what to call it! Found that Front lower panel. Crazy expensive, $450+ shipping from Holland. GM price on it was $80 or so, but every place I find who has it listed, are out of stock. Found a S10 rear axle and T5 on Craigslist, waiting for dude to get back to me on it. Trying not to pay over $250-300 for the pair, otherwise I can pick up a rust S10 with blown engine for a couple hundred more. Have a local guy who expressed interest in trading me a "running" LD9 for the DC Sports header I have. 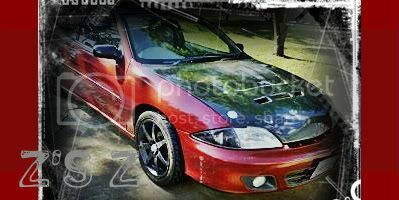 Need to sell the rest of the Cav parts (and a few GTO parts) to fund this project ! Sounds like we should have progress pics in the not so distant future. Researching carbon fiber vacuum bagging right now..... going to try my hand at replicating the "simple" interior panels in the chevette. Dam if you get good at it, I might need to drive back up to your house and have you do some dakota parts for me. I'll have to ask my buddy if he still has his setup, it's been a few years since he did a few parts, but being a auto body guy, I'm sure he kept it. Damn laptop battery just died! Thank god for my iPhone! I love smart phones for surfing but hate the little buttons for posting......what do they have you doing 3.5 hrs away? I'm at work mysef ight now, via cell. Work for McLane driving Semi and delivering food/supplies. Wed/Thurs I'm down in Pekin IL. Sun/Mon I'm down in Porter/Hobart IN. Gotchya, I'm all over the chicago area from palatine to joliet and glenwood to naperville fixing carwashes. Worked on it some today. Ordered up a complete ES Bushing kit for it, should have it by end of the week, so started removing the front suspension. Found out something great, the Eibach Cavi front sway bar should boot right in! Laid it on top of the stock Chevette one and it's almost perfect fit! Found a set of S10 2" drop spindles on Craigslist that should work, and let me match front and rear bolt patterns. Also stopped at a junk yard, they want $400 for Trans, Drive Shaft, and rear axle from a '88 S10, pulled for me, no warrenty...... but for $600 I can buy a whole S10 off of CraigsList. Once I get it back on all 4 wheels, I can take it to have the floors patched up and coated. Oh..... and also found the perfect brake booster for it..... Geo Metro! Found two in the yard, looks like it wouldn't take mutch to make it usable. I should be around tomorrow night... not so sure on the woman but I might get a hold of you and see what you are up to. Sounds good Vince. If Jamie's not busy, we can go check out his project. Finaly got the suspension dropped out. Had to use a grinder to cut some bolts out. and alero wheels?! again yuck. you know that thing would look awesome with 95-99 z wheels. Colors wise, the Army green is better than the blue it is now (which is what the wife says I should keep! lol), and the orange would be limited to the suspension parts. But again, who knows, it's a long ways off from paint. But it is race car! My winter beater, daily driver, race car! I think it'd look badass in a flat Olive Drab/Army Green.... Now, orange underpinnings.. notsomuch. Black or tan would look good though. I mean, ultimately it's your car, do what you will, I've just never been much for crazy bright colors unless they're on the main body of the car. The brighter colors are what will draw the eye first, and suspension parts generally aren't pretty to look at lol..